SACRAMENTO — The California Department of Fish and Game received news Sept. 2 that the Marine Life Protection Act’s South Coast Region no-fishing zone regulations have been rejected by the state’s Office of Administrative Law (OAL). While more than 15 percent of Southern California’s coastline had been earmarked for no-fishing-zone enforcement in October, that plan is on hold — and the department will now work to get the third installment in California’s planned string of Marine Protected Areas (MPAs) to meet the state agency’s requirements. The OAL must sign off on the South Coast Region MPA regulations, created last year under a process authorized by the Marine Life Protection Act (MLPA) Initiative, before they can be put into effect. The OAL has directed Department of Fish and Game officials and the Marine Life Protection Act Initiative team to correct deficiencies in the final regulations. A document released by the OAL listed a number of reasons for the decision to disapprove the planned regulatory action. 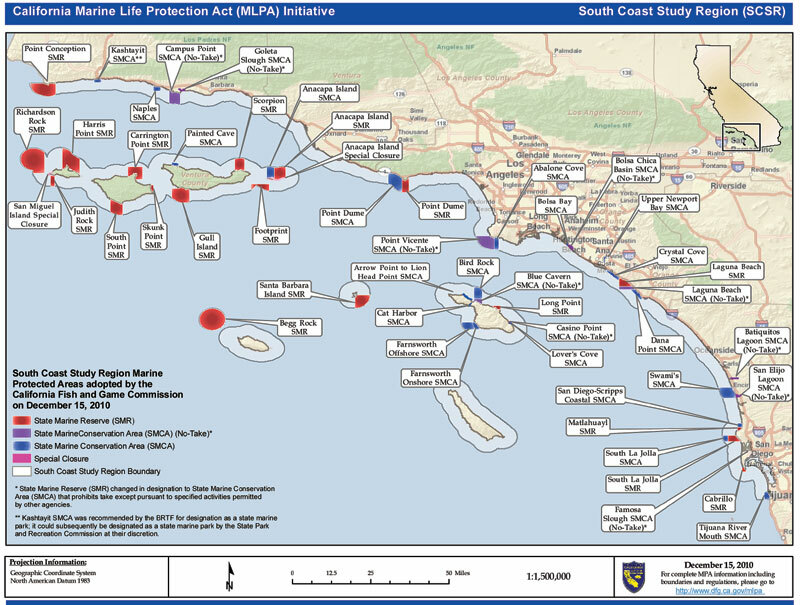 Reasons included officials’ failure to provide reasons for rejecting alternative MPA plans that were considered in the planning process, failure to respond to all of the public comments made regarding the closures, failure to form a statement of specific purpose for adoption of each closure and failure to explain why each provision of the adopted regulations is required to carry out the MLPA’s goal. Department of Fish and Game spokeswoman Jordan Traverso said the Fish and Game Commission expects the disapproval to only delay the enforcement of the Marine Protected Areas and estimates a timeline of “months, and not years” to implement the new fishing closures. “OAL let the commission know that they wouldn’t make the Oct. 1 deadline because they needed some more information in their review of the regulatory package, and it would require re-notice, reopening the 60-day timeline they have for review,” Traverso said. Adding further uncertainty to the timeline for these regulations is a pending lawsuit filed by members of the Partnership for Sustainable Oceans, a group representing the interests of California’s recreational anglers and boaters in the MLPA process. The lawsuit seeks to set aside the MPA regulations for the North Central and South Coast study regions, citing a lack of statutory authority for the Fish and Game Commission to adopt the regulations and, in the case of the South Coast regulations, numerous violations of the California Environmental Quality Act in the commission’s environmental review of the regulations. A hearing on the North Central Coast portion of the case has been set for Sept. 26 in San Diego, but Traverso said the pending litigation had no bearing on the OAL’s decision. “The delay in approving the MLPA South Coast regulations should provide some comfort to the many anglers and commercial fishermen who may have had concerns about whether, come Oct. 1, they’d be able to fish in their favorite areas,” said Bob Fletcher, former president of the Sportfishing Association of California and a plaintiff in the lawsuit. “Whatever the OAL’s issues with the South Coast MPAs may be, it is clear to us that these regulations are the result of a flawed process and should be overturned,” said David Elm, chairman of United Anglers of Southern California. New United Anglers of Southern California board member Wendy Tochihara added that anglers should be aware that while the closures have been delayed, large swaths of their favorite fishing areas could still eventually be closed. “I’m very relieved and very hopeful that the Office of Administrative Law will take their time to go through the regulatory package with a fine-tooth comb,” Tochihara said. On Dec. 15, 2010, the Fish and Game Commission adopted regulations to create a series of Marine Protected Areas in the South Coast Study Region, which spans state waters from Santa Barbara County to the U.S./Mexico border. Developed under the MLPA Initiative planning process, this network of 36 MPAs would be added to the 13 existing MPAs and two special closures in the Northern Channel Islands, which were established in 2003. Combined, the 49 MPAs and two special closures cover approximately 354 square miles of state waters and represent approximately 15 percent of the region. The South Coast Region MPAs would be the third of five regions to be implemented through the MLPA process.